Every 10 minutes in the United States, a child younger than 6 years old is taken to the emergency room for possible poisoning from swallowing a medicine. In fact, unintentional poisonings from medicines (whether prescription or over-the-counter) cause more emergency room visits for young children than do car accidents. In January 2012, the C.S. Mott Children’s Hospital National Poll on Children’s Health asked parents and grandparents of children 1-5 years old about the presence of medicines in their homes and how they store those medicines. In addition, adults across the country were asked whether they would support requirements for new types of packaging for medicines to reduce risks for children. Nearly all parents with young children (97%) report that they have medicine in their homes. Over-the-counter medicines are present in virtually every home (95%), while prescription medicines are present in most homes (79%). The vast majority of grandparents of young children (98%) also report having medicine in their homes; 85% report having prescription medicines. “Easy-access” medicines are those in easy-to-open containers that keep doses handy (e.g., daily dosing boxes), or medicines that are not kept out of reach of young children. Nearly 1 of every 4 grandparents says that they store prescription medicines in easy-access ways (Figure 1). 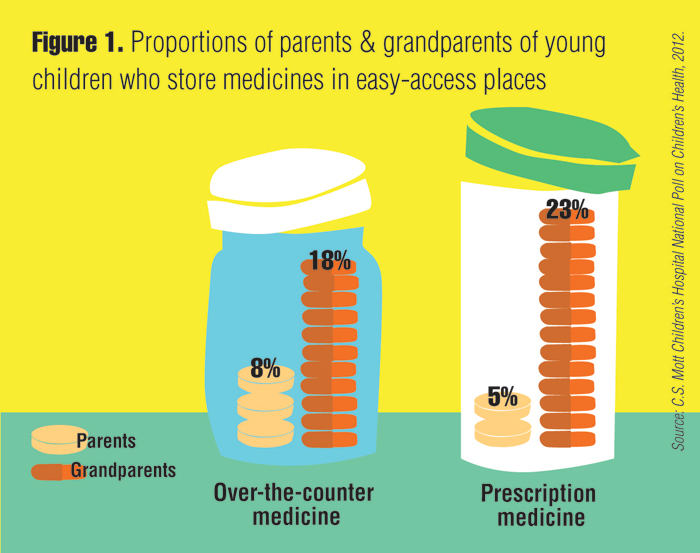 Grandparents are much more likely than parents to report that they store medicine in places or situations that young children can easily access. One strategy for limiting medicine-related poisoning involves packaging medicines in ways that make it harder for young children to ingest large quantities. In this poll, about two-thirds of adults say they would support new laws that would require companies to package tablets, capsules and liquid medicines as single doses. Overall, 79% of parents and 85% of grandparents of young kids report having prescription medicine at home. Grandparents are 4 times more likely than parents to keep prescription medicine in easy-access places. About two-thirds of adults overall would support potential new laws that would require medicines to be packaged as single-dose servings. Emergency room visits for accidental poisonings among young children have become much more frequent in the past decade in the United States. The most common type of prescription in an accidental ingestion by young children involves painkillers that contain morphine or morphine-like drugs. The most common type of over-the-counter medicine involved in accidental ingestions by young children includes acetaminophen, a commonly used fever-reducing medicine. To keep children safe, parents and grandparents are generally urged to keep medicine out of reach of young children, in child-safe containers. Nevertheless, substantial numbers of parents and grandparents report in this Poll that they store over-the-counter medicine and prescription drugs in containers that are easy to open and/or in locations that are easily reached by young children. The support for potential new requirements for single-dose dispensing of medicine in solid and liquid format is quite strong in this Poll. However, there may be barriers to passage of such legislation – not the least of which are environmental concerns about increasing packaging. Therefore, the findings in this Poll are a reminder to parents and grandparents alike that a “child-proof” container only functions that way when the cap is screwed on tight. Doses of medicine kept out of their original containers will be safest if kept locked up and out of reach of young children. This report presents findings from a nationally representative household survey conducted exclusively by Knowledge Networks, Inc. (KN), for C.S. Mott Children’s Hospital via a method used in many published studies. The survey was administered in January 2012 to a randomly selected, stratified group of adults age 18 and older (n=2,131) from the KN standing panel that closely resembles the U.S. population. The sample was subsequently weighted to reflect population figures from the Census Bureau. The survey completion rate was 60% among panel members contacted to participate. The margin of error is ± 1 to 8 percentage points. Findings from the C.S. Mott Children's Hospital National Poll on Children's Health do not represent the opinions of the investigators or the opinions of the University of Michigan. The University of Michigan reserves all rights over this material. Davis MM, Singer DC, Butchart AT, Kauffman AD, Clark SJ. Easy-access medicines a poisoning risk for kids at home. C.S. Mott Children’s Hospital National Poll on Children’s Health, University of Michigan. Vol 15, Issue 2, April 2012. Available at: http://mottpoll.org/reports-surveys/easy-access-medicines-poisoning-risk-kids-home.